Missing in Iceland from Alexandra Guité on Vimeo. A mockumentary created in 24h by Alexandra Guité and friends. 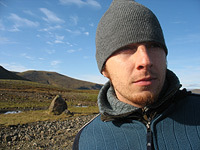 Iceland, 2007. Famous wildlife filmmaker Eric Deutchmann disappears strangely on a special shoot up north. We followed his final traces. Montreal’s Lion D’Or, October 2009.